No matter the size of the gathering, a Premier Ultimate Party Tent has definitely got you covered. 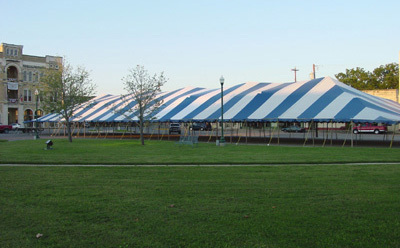 With dimensions that span 60 feet by 180 feet, this pole tent is designed to withstand weather and wear. The "Block Out" top provides protection for wind and rain as well as harmful UV rays; the perimeter is reinforced with 2-inch seatbelt webbing, making it tear resistant. You get all the poles you need for set-up, including side poles, center poles, and even quarter poles, as well as the stakes and "guy ropes." You will also get a demonstration video to help you set up this enormous tent.